It was the day Iron Mike Houlihan met Ironic Mike Houlihan. Mike Houlihan meets Mike Houlihan Cousins? Maybe. As we traveled through Limerick we stopped at a bar in Kilmallock with the name “Mike Houlihan” prominently displayed on the street. I once owned a bar in Rockaway Beach, New York with my partner Pete Dooley known as “The Houli Dooley”, but this pub was much nicer. 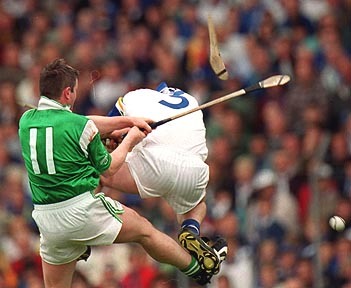 Especially since it was owned by Mike Houlihan, who during the course of a decorated career with club and county, won two Munster titles, two national Hurling Leagues, two county titles and two Munster club championships. 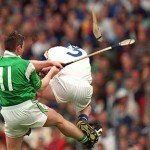 He represented Limerick in the 1994 and 1996 All-Ireland senior hurling deciders at Croke Park. And he just happened to have the exact same name as me. Mike came over to meet us and we filmed this meeting for “Our Irish Cousins”. It was great to meet a Mike Houlihan who actually won a few fights in his life and he bought us pints of Guinness as we compared notes on our names. 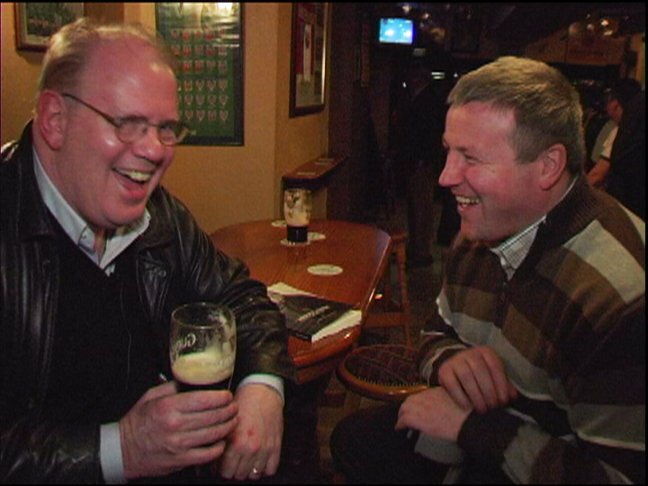 Mike has since gone into politics in Limerick as a County Councilor but when he walked into his bar that night you’d think he was Mickey Mantle. You’ll catch all the fun of this meeting of an Irish legend and an Irish-American legend in his own mind in our new film “Our Irish Cousins”. Please consider supporting the Our Irish Cousins project today. I chuckled when you said, “everybody’s a cousin,” in your video preview. That has been my line for a while now. For the past four years I’ve been a genealogy junkie. The trail back across the pond to Ireland is filled with bread crumbs on both sides of my family. I have discovered that if anyone in Ireland is not our cousin then they were born on another planet. Our Redmond family comes from Hollyfort, Co. Wexford near Gorey. The locals there have been friendly and helpful with finding the records of our folk, Great, great, great grandpa William Redmond came to Canada about 1850 with his son John and daughters Mary and Jane. His wife Alice (nee Brennan) had died in December 1847. It seems an elder son, Joseph, remained in Ireland. The family prospered in Canada. While Postmster of the area in 1894 Great great grandpa John Redmond named the area north of Kingston, Ontario, ‘Holleford’ after his home village of Hollyfort. I have been contacting locals here and in Ireland in regard to twinning the two communities. On dad’s side we have more Irish ancestors too…Donnell, McFarlane…and others. My mom’s family leads me back to the Lloyd family of Co. Tipperary. Great great grandpa John Lloyd came to Canada in 1856 with his second wife Mary Ann Minton Mary Ann was born in Dungarvan, Co. Waterford and baptised in the RC church . The Lloyd family owned a fair amount of land in Co. Tipperary. (about 10,000 acres by 1870-ish records) Lloyd Cousins in Co. Offlay owned about another 5,000 acres just a hip hop from Moneygall where your Irish (ha ha) President Obama’s folk lived. John Lloyd owned Lisheen Castle near Thurles. It was set fire by local IRA just two weeks before a truce during the Anglo-Irish war. Now it has been renovated and can be rented by the day or more. Nice digs. It was John’s parents, Frederick Lloyd and Julia Vereker who had built the Tudor revival castle attached to an old manor home. Frederick Lloyd had been a councillor of Limerick City and was Mayor of that City 1798 and 1799. Julia was sister of Charles Vereker, 2nd Viscount Gort who was MP for Limerick City, Governor of Co. Galway etc…With the family connections to the Smythe, Prendergast and other famlies it makes for interesting family history reading. I mention some of this as I noted your friend Mike Houlihan is in Limerick politics. I have had fun connecting with cousins still living in Dublin and in Thurles, Co. Tipperary and with those scattered around the globe. The internet is amazing. Seek and you will find. I posted on an Irish roots website in December three or four years ago and within two days I received and e-mail from another great great grandson of John Lloyd (by his first wife). Together we have been putting the family story together. I hope your project flies well. Thanks so much for your comment and the story of your genealogical discoveries and your family. I appreciate you taking the time to tell me your story and support for our film. Please tell your friends!